TDs said today that Jacon Rees-Mogg’s comments were unhelpful and showed a lack of understanding of the issues at hand. 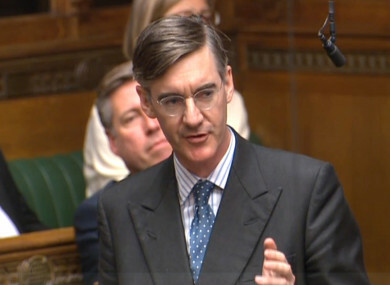 TDS HAVE CRITICISED comments made by Tory MP Jacob Rees-Mogg, who said the UK should call Ireland’s bluff on the issue of a border. Speaking to the Irish Times, he said he believes British Prime Minister Theresa May should “simply make it clear that we will not put up a border and that is our position”. He also dismissed the EU’s argument that its rules demand it should police its external borders and protect the integrity of the single market and the customs union. He suggested that the European Union could ignore its own rules and make an exception in this instance. This is one of those things we must not fall for. The EU says this is EU law. It is holy writ. Moses has brought it down from the Alps, when he was not busy in the Sinai, and therefore it must be obeyed. Whenever it is convenient to the European Union, European law is adjusted. It is political rather than legal. Sinn Fein’s Brexit spokesperson David Cullinane said he believes Brexiteers like Rees-Mogg are “trying to pretend they can have their cake and eat it too and also trying to pretend the EU can essentially break the rules of the customs union”. “Rules exist for a reason and once you’re in the customs union you have to abide by those rules – if not you are subject to checks and tariffs. He knows that. TD Lisa Chambers, who is Fianna Fáil’s spokesperson on Brexit, told TheJournal.ie she found the Tory MP’s language “unhelpful”. “The Irish government has been trying its best to ensure the UK gets a good deal. There is a large amount of trade back and forth and we are very close neighbours, we have a lot of history. We appreciate that a bad deal for the UK is a bad deal for Ireland. She said his comments about simply telling the EU there will not be a border displays “a lack of understanding” of what his own government agreed to last December in the backstop agreement. This is a fallback clause that would see the UK remain in alignment with the EU’s customs union rules in the absence of another solution after the two-year Brexit deadline has passed. Without the backstop agreement, there could be no withdrawal treaty and this would see the UK crash out of the European Union. “That may be okay for him with the privileged position of no financial concerns but for many of his citizens in the UK that would be hugely detrimental in terms of the damage to the economy and financial hardship. When asked for its response to the Tory MP’s statements, the Department of Foreign Affairs said it did “not have any comment at this time”. Email “Tory MP's 'call Ireland's bluff' comment is just 'scraping the bottom of the barrel'”. Feedback on “Tory MP's 'call Ireland's bluff' comment is just 'scraping the bottom of the barrel'”.